Fix your dead or noisy video card fan. Recently I had the opportunity to take apart and fix a pair of AMD HD 5870 reference cards. I didn’t have to take them both apart, and I only needed to fix a noisy fan on one of them. A noisy fan is usually due to the grease or oil drying out in the ball bearing chamber of the card. 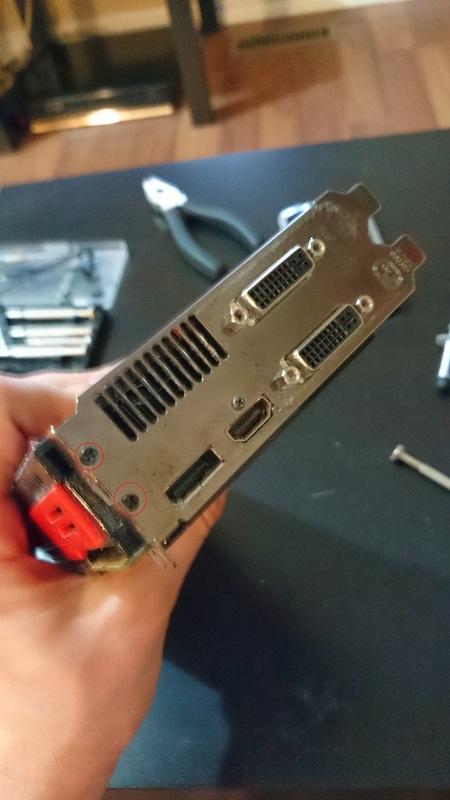 This card gave me a good 4 years of service before it started making noise. Although after fixing the fan of one the cards, I noticed how quiet it got and that it’s temperatures and fan speed were lower than before. So I decided to do the same to the second card. Here is what a reference 5870 from AMD looks like. All AMD reference cards are built in a similar fashion and this process is applicable to them. Here are the materials that were used to tune up the cards, jewellers screwdriver set, a pair of pliers, thermal paste, a mixture of water, vinegar, and lime juice, alcohol works as well and so does cologne as it’s alcohol based, and 3 in 1 all purpose oil. Optionally a can of air might help to get the dust out of the fan and heat sink fins. If you want to test your cards temperatures and fan speed prior to this, install Furmark, it will allow you to stress test the card (Burn-in) and capture the metrics. So for the 5870 as for many of the reference cards flip it over to the fan opening is facing down and remove the marked screws. The ones in red are a different size than the ones in green. There are also two screws on the port face. Once you’ve removed the screws, and lifted the back plate and the bracket in the middle carefully separate the PCB from the heat sink and fan assembly. Slowly and with care start prying the PCB from the fan and sink assembly at the sides, closest to the port plate. Keep prying with your fingers while moving towards the other end. Be careful not to separate the PCB from the assembly with too much force as on the other end the fan is connected to the PCB and you don’t want to rip out the connector. Pry with fingers from one end to the other. Once separated fold open. Note the fan connector. Note that the only thing holding the PCB to the heat sink assembly is the dried thermal paste. It should not take a lot of force to pry it away, but you should still take great heed and care while doing this as not to damage any of the transistors or resistors, etc. Otherwise you’ll need to bust out the soldering iron. Also be careful pulling the PCB apart because on the opposite side to the port plate is the fan connector, you should pry the PCB about a centimetre away from the assembly then fold it open as seen in the image above, so you can detach the connector from the PCB. You should rest the PCB on a non static towel or mat after this. Be careful with the thermal stickers on the cooling unit, unless you have spares make sure you keep them in tact. Red = housing screws, Green = fan screws. Next we’re going to take apart the fan and heat sink assembly so we can clean it and lube the fan. Remove the screws circled in red, at this point you may also want to remove the screws circled in green, those belong to the fan. Note that if you do remove the ones marked in green, be careful removing the plastic housing and make sure the fan doesn’t go flying out. 3 jewellers screw drivers used to pry open the fan motor. 3 in 1 oil used to lube the fan bearings. Motor and fan, drop oil in marked bearing chamber opening. See that circular sticker on the bottom side of the fan, usually underneath it is an opening and access to the bearing chamber. With normal fans you should be able to heat it up with a blow dryer and peel it back to expose the opening and be able to put in 3-5 drops of all purpose oil. Well it’s not the case with these reference cards, these have that part sealed off. Our only option it to pop the motor out and put the oil in through the top. In order to do that you need to wedge in 3 screwdrivers between the corners of the triangular plastic piece that is attached to the motor and the fan. It should be a snug fit. Once you have done so apply equal downward pressure on the ends of all 3 screwdrivers, and once you hear a loud pop, stop. Now lift and remove the motor from the fan. Now you can add 3-5 drops of all purpose oil into the bearing chamber, try to only get it in the chamber. Once you have done so, push the motor and fan back together until you hear a snap. Spin the fan while holding the motor for a minute or two so that the oil circulates in the chamber. Below is a video demonstrating the removal and separation process of the motor from the fan. The oiling of the bearings and removal of the dust, made a huge difference in both cards. I was able to knock off about 4 degrees in temperature and 4% in fan speed in both. Also to note one of the cards started running silently again. UPDATE 2016/03/09: I have since used this method a couple times. I bought an R9 290X off eBay and 2 out of 3 fans wouldn’t spin. Using the above method I brought them back to life and have been using the card for over a year without hiccups. 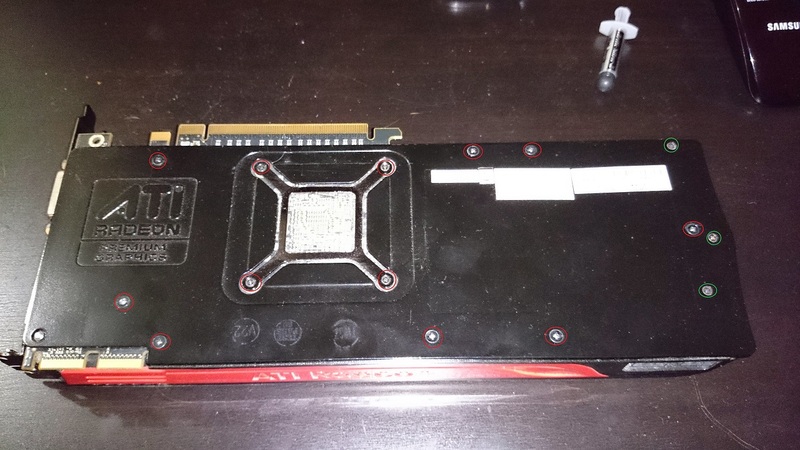 This entry was posted in Gaming, Hardware and tagged AMD 5870, fix a broken fan, fix GPU fan, GPU, HD5870, how to fix a broken gpu fan, lube video card gpu fan, rattling gpu fan, repair a fan, video card fan repair by Nerd Drivel. Bookmark the permalink.